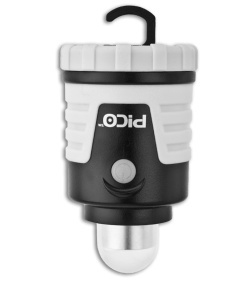 The Pico Glo Glow-in-the-Dark LED Mini Lantern from Ultimate Survival (UST) is definitely a must have when you're packing for that hunting or camping trip. The Pico Glo has the same quality as the original Pico Mini but with a glow-in-the-dark feature! To activate, expose the lantern to light for 5-20 minutes. 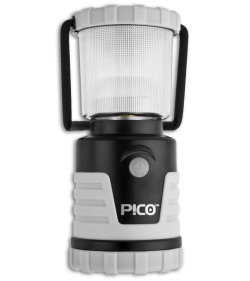 The Pico Glo will be activated for up to 2 hours. The Pico features a 1 Watt Nichia white LED that runs on 1.5V 4 AA Alkaline batteries (not included), 3-mode electronic switch- High (123 Lumens, 22 Hrs); Low (18 Lumens, 91 Hrs); and SOS signal. Other features include a built-in recess hook, a specialized cap for a smoothing beam, and a rubberized housing unit that makes the lantern impact resistant (up to 1 meter). Water resistance IPX4. Measures 5.25" x 2.25" and weighs 8.64 oz.